HiTrainer IS REVOLUTIONIZING SPORTS TRAINING with a combination of advanced performance analysis solutions and high intensity training on a single machine. Eric Joly's passion is producing results for competitive athletes seeking to advance their strength, reaction times and overall performance. His commitment to high intensity, low impact conditioning makes him an enthusiastic HiTrainer advocate. Since 2008 he has owned and managed Staxx Performance in Sherbrooke, Canada, where he uses the HiTrainer system to increase cardiovascular capacity, improve cognitive abilities and maintain peak power and speed. As the owner of STAXX, and formerly Houston Strength and Conditioning, Eric understands the needs of sports training studios and how to build business. He has served as head strength coach for both Bishops University and Sherbrooke University and was the assistant strength coach at the University of Houston. As a strength and conditioning consultant, Eric stages evaluation and testing camps across Canada. 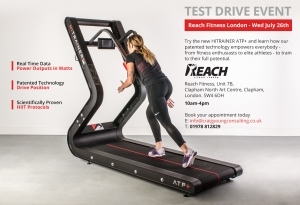 Don't miss our exclusive test events: HiTrainer Test Drive Event - Reach Fitness, London, Wednesday 26th July, and HiTrainer Test Drive Event - Gym Gear UK, Preston, Thursday 27th July, to see and try out this amazing system for yourself.